Sheep-Isle has decided to collect and file literature and articles about the spaelsau. We hope this will help to understand the uniqueness of the spaelsau. 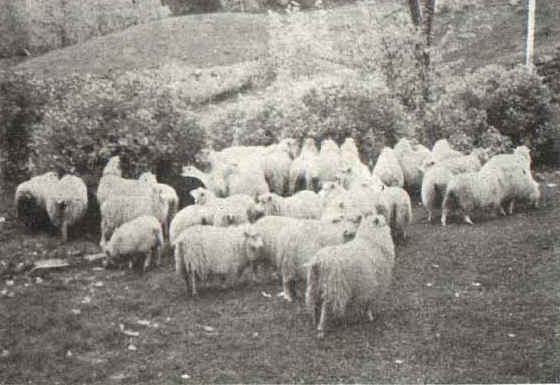 Sheep-Isle must in particular learn about the advantage the spaelsau have compared to other breeds in adapting to the nature on Hjelm. (In the Scandinavian sea of Kattegat). There is especially one name that one continually comes across when reading about sheep in Norwegian literature. 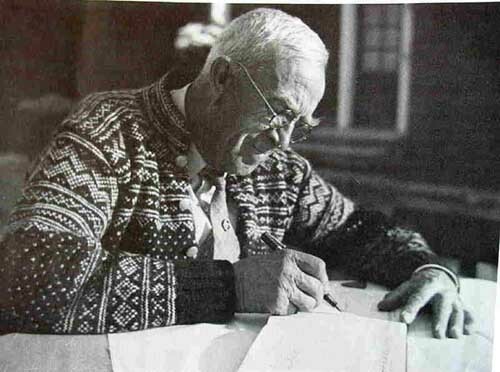 This is JON SÆLAND (1876-1963). Sheep-Isle regards Jon Sæland to be in a class of his own when it comes to sheep-breeding in Scandinavia. WE WILL TAKE THIS OPPORTUNITY TO SEND A GRATEFUL THANKS TO THE SÆLAND FAMILY, ESPECIALLY GUNLEIV SÆLAND AND EINAR SÆLAND, WHO ALLOWED US TO PUBLISH WRITINGS ETC. BY JON SÆLAND!
" The Government Official who charted his own course". Here comes a typical article by Jon Sæland on the spaelsau. It is found in the book "Mannestrid" (Men’s fight), written in Gvarv 24.06.56. Jon Sæland was Government Official from 1918 – 1946. He was the only one on sheep at that time, and his influence was unequalled. From the Scandinavian version of Sheep-Isle a summary of his life and writings will later be translated. The spaelsau is better than all other sheep breeds in the country, when it comes to production compared to bodysize. Information about recorded production for sheep 1954-55 are now printed (in Sheep and Goat) and again we clearly find that no other breed can compete with the spaelsau when it comes to having high lamb-yield. As on can see, the spaelsau has given a lamb-yield that is as much as 15,1 kg higher then the dalasheep, which is second best. The spaelsau has also been the best during the years the Sheep Recording System has been operating in this country, and it is not only here. Also in Sweden. This is why we can expect nothing else than that many sheepbreeders in our country will open their eyes and wonder about how that old sheepbreed, which has not been appreciated and which has been given the knife to make room for imported foreign breeds, not only manages to compete with these but even in some areas exceeds them when compared on the same basis with others. 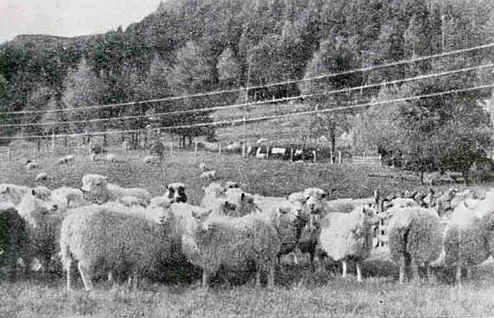 It must be mentioned here that the Sheep Recording System in Sweden, as early as in 1941, showed that the spaelsau in this country gave a lamb-weight of 92.4 kg. (for 5 months old lambs) pr. every 100 kg of ewe while the same numbers for sjeviot and oxford down was only 65.6 and 67.7. From my own experience with Norwegian breeds of sheep, I could, even as early as 40 years ago, write in my first book about breeds of sheep that if we had taken care of our own spaelsau when it was a fashion to kill it and replace it with foreign breeds, we would (40 years ago) probably have had a better sheep in the country then the one we’ve got. From what we know now, using the Sheep Recording System and with a lot of experience all around the country as a basis, we can prove that this was the truth. We can now add the fact that if we had the wisdom to do it this way we would have even saved a lot of expense for the state and for each sheepbreeder. mountains autumn 1955. Approximately 2/3 of this herd are lambs together with their mothers. But it is of course very important and valuable that we now have come this far that we know all this, and can take it into consideration during our further work. Knowledge like that which we now have got about the story of the spaelsau might also teach us some things about other livestock as well, like cattle. Regarding cattle we are just now in the point of time where we are killing down a lot of the local Norwegian cattle. Where are you going, farmer? The spaelsau has done well. But is the solution for everyone to go back to the spaelsau as quickly as possible? No, it is not. But according to what we now know, about it and the other breeds it will for sure increase in the country over time, because we now know: when it comes to the most important characteristics we demand from the sheep, to produce lambs with high bodyweight, - under the conditions we give it, it is far better than the other breeds we have here in this country. Only approximately half a century ago the spaelsau was almost extinct in the country, but even if he has been increasing in numbers during the last forty years, this is still only a few animals compared to how many sheep we have of foreign blood. But this is also good, and should therefore at least remain the situation without shifting direction too quickly. Especially in consideration to the sheep-owners it should be so. The breed of sheep which they have become fond of they must as long as possible be allowed to keep because "the will of the man is the man’s heaven". One often does better with the things one loves most. Usually the situation is that every sheep-owner wants their ewes to give twins. The present situation, when using the Sheep Recording System, is that the spaelsau rate first with 1.59 lambs surviving to autumn for each winter-kept ewe (included the ewes without pregnancy). Second best are the sjeviot with 1.50 lambs. Then there is the dalasheep with 1.47, and rygja and steigar with 1.42 lambs. When it comes to amount of wool the dalasheep are best having 3.72 kg pr. ewe and year. After comes the steigar having 3.56, the sjeviot having 3025, the rygja with 2.87 and the spaelsau having 2.38 kg wool in average per ewe per year. Here the spaelsau was producing less, but this is logical since the weight of the wool is not calculated pr 100 kg of bodyweight but in average pr ewe. If we had been calculating the amount of wool pr 100 kg of ewe would we find that the spaelsau is the richest in wool of them all. When it comes to the well-being while grazing the dalasheep have first place and sjeviot are straight behind, but the steigar are not even half as good as the best. Rygja and spæl are close and we have to conclude that the spaelsau, with its 14.2 kg has been extremely good, remembering that it has more higher lamb-weights compared to the others and raises a higher number of lambs as well. 8 ewes from Ålvundeid have become the best of all ewes in the Sheep Recording System, having an average lamb-weight of 140 kg. The district Inner Hardanger is even better because they have, for as many as 25 ewes, reached an average production of 139.7 kg. Unusually high comes also Voss district having a yield of 133.8 kg for 31 ewes and Gjestal district of 131.5 kg for 8 ewes. Overall we see that the Sheep Recording System give interesting information about the different breeds of sheep in our country, and therefore we must hope that the information which already now has been published will be carefully studied by sheep-owners all around the country. Especially regarding the innovators we must expect and hope that they will take their time to study the results well.